My Greyhawk looks like this. Esurient Thieves! Beware the Golden Bones! With apologies to Erol Otus. Yet still more inspirational art! I got this mug at a Renaissance fair when I was fifteen. It will hold an entire bottle of mead, and it has done so many times. I'm a bit surprised that it has survived undamaged for so long as it has seen much hard use over the years, and little careful handling. Especially at nearly two pints per fill up. Looking at it on the shelf yesterday, I decided to immortalize it as a unique magic item for a future campaign. I thought it fitting to make it something that would cause trouble and launch adventures, since, it's surely done that in the past. A singular magical item, the Dragon Tankard is a large, heavy, clay mug with a sculpture of a rampant dragon wrapped around it's face. Drinking from the tankard will confer upon the imbiber the dragon speech for a limited time. This will give the ability to mesmerize listeners and plant Suggestions as per the spell. The entire contents of the mug must be drunk, and the mug must be full for the magic to take effect. The power and duration of the magic depends upon the strenght of the beverage used. It must be alcoholic, at least beer, with wine causing more powerful effects, brandy or liqueurs still stronger, and uesgah or aqua vitae having the greatest possible effect. Drinking a full tankard of beer will give the drinker the power to command the total attention of all persons within ten feet for three rounds and the ability to make a single suggestion to one person. Drinking a full tankard of wine will give the drinker the power to command the total attention of all persons within thirty feet for five rounds and the ability to make suggestions to two people. Drinking a full tankard of brandy will give the drinker the power to command the total attention of all persons withing fifty feet for ten rounds and the ability to make suggestions to five persons. 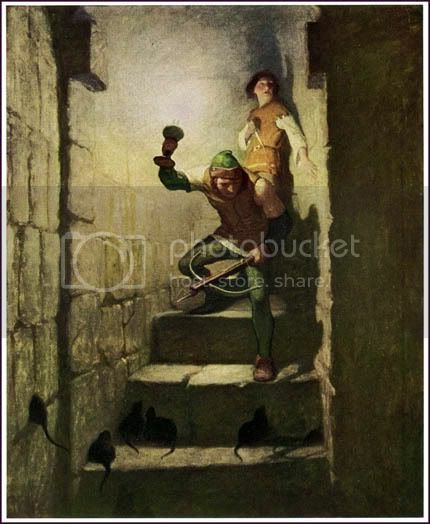 Drinking a full tankard of uesgah with give the drinker the power to command the total attention of all persons within one hundred feet for five turns and the ability to make a mass suggestion as per the spell. 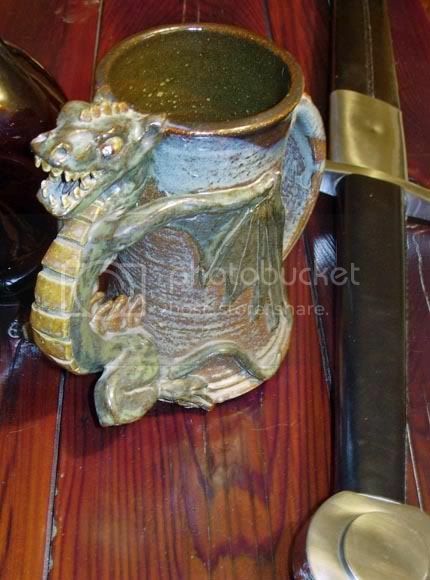 The Dragon Tankard in no way protects the drinker from the deleterious effects of alcohol. Drinking a tankard of beer will cause no ill effects, and a tankard of wine, only a light sense of satisfied confidence. 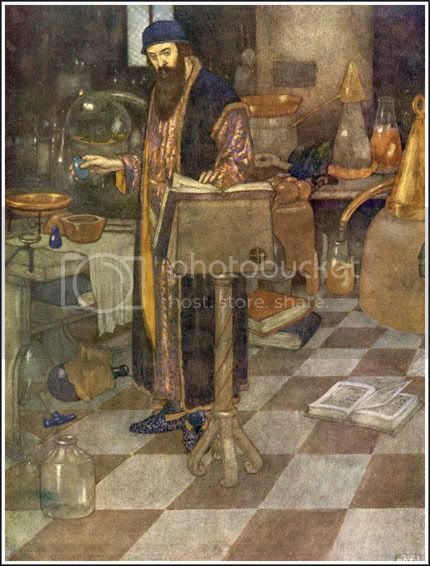 A tankard of brandy or uesgah however, will require the drinker to save vs poison or be inebriated. Failure to save requires Dungeon Master consultation of the intoxication table, page eighty-two of the Dungeon Masters Guide. Brandy will result in Moderate intoxication and uesgah will result in Great intoxication. *normally charisma would suffer with drunkenness, however, the magic of the tankard will cause onlookers to perceive even incoherent babbling as though it were the wisdom of the ancients. Moderate intoxication will require 2-4 hours to wear off, Great intoxication 4-6 hours. Dwarves receive a +2 alcohol resistance bonus to their save vs poison. Constitution bonuses may also be applied toward the save vs poison. Dungeon Master adjudicating of drunken behavior must be carefully considered. At the state of Great intoxication, the Dungeon Master has partial control of the player character, acting as the Id. All sorts of deep desires and hidden motivations will surface under the influence of sufficient uesgah.
" And so, good people of Pluffmun, I say to you , the insolence of the Blor of Nudge must no longer be tolerated! No more sneering down his Long, warty nose, no more flouncing about and leering at our partridges! I say we go now and stuff his well with goat droppings!" " Yess! Yess! Let us bespackle his stonework with offal!" " What happened to, "put your heavy purses in this sack so that I may carry them for you?" "Mauger that! I am inspired! Justice must be done!" Bob Gould. You probably recognize this guy, right? If not, just go away now, I can't talk to you. I think of the Melnibonians as excellent models for the Ancient Suel. Elric himself especially so. An Albino, eldritch wizard and deadly warrior at the same time, summoning and binding demons and elementals to do his will. That's how I see the aristocracy of the Suel Empire before the fall. Amoral at best, concerned only with self will, and seeing all others as tools to be employed to suit their purposes. Elric is a perfect image of a Lord of the Suel in ancient times. 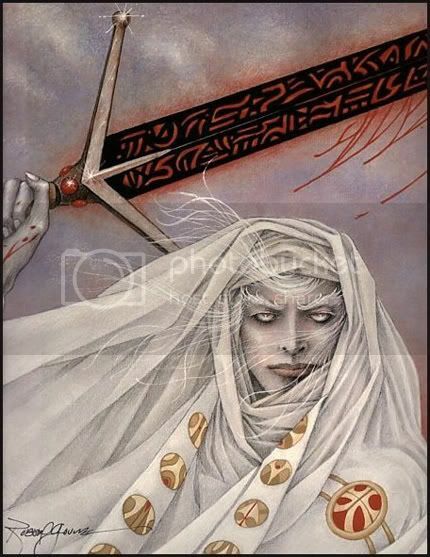 White haired, remote from humanity, dark magic flowing through his veins, with a hell forged sword howling it's soul hunger in his long hands. I create the rare npc in my Greyhawk of such lineage. Human, and a sword wielding magic-user, but this is never open to player characters. I only use them as antagonists. In my mind, the rules that govern player character magic use and weapons,may, or may not rule the npcs that players encounter. They can never expect to know the abilities of everyone they meet just because that person wears plate, or carries a staff. Kay Nielson. This is another from East of the Moon, West of the Sun. Just a piece clipped from a larger illustration. A more romantic image, but still in keeping with the sophisticated empire I think of. I especially like the braided mane and tail on the horse, obviously a large, well bred animal. I really wanted to show you the shield and sword though. Just looking at them gives me ideas for bizarre magic items. I mean look at the face, does that shield talk? Does it scream a war cry, or speak a Word of Power? That sword is enormous, obviously a two-hander, but he carries a shield so he must be able to employ it with one hand. Does it grant him strength? Is it lighter than it should be? Does it dance on it's own? Maybe it's the home of a bound spirit and fights without human hand. Charles Keega. 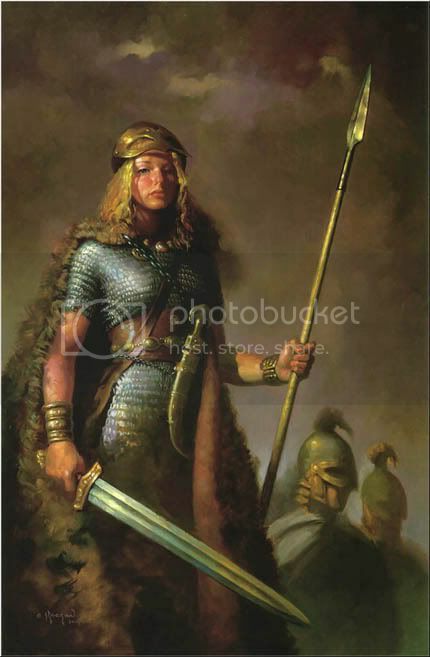 This is a Suel descended shield maiden of the Snow barbarians to me. I see the situation between the Old Suel and the Thrillonian barbarians as some what similar to what happened with R E Howard's Atlanteans. Falling into barbarity and re emerging as the Cimmerians. Do you remember TSR's Howl from the North? Iuz pretends to be a returning northern god to bring the tribes together to launch his war against the rest of Greyhawk. What if instead, one of those suel wizard-lords of the old blood decided to overcome the barbarians aversion to magic and reveal to them their ancient heritage, what if he dreamed of a revived Empire. Of the north this time instead of the south. What if he strove to unite the Frost, Snow, and Ice barbarians in a single nation. I think you could build a long term antagonist for your players with such a person. They could race him to reach some lost magic or item, fight his agents or engage in political skulduggery, heck, they might be of like mind and wish to aid him. hmmmm, now I'm gonna be kicking this around in my head for a while. From the Guide to the World of Greyhawk.
" The Oeridians have skin tones ranging from tan to olive. They have hair which runs the gamut of color from honey blonde to black, although brown and reddish brown are most common. Like-wise, eye coloration is highly variable, although brown and gray are frequently seen in individuals." The top image is from Jeff Jones, I picked it because to me it looks like an oeridian fighter, maybe at a pause in his weapon practice. I imagine him to be a minor noble during the two hundred year period of expansion into the Flanaess, a time of constant war with the Suel. 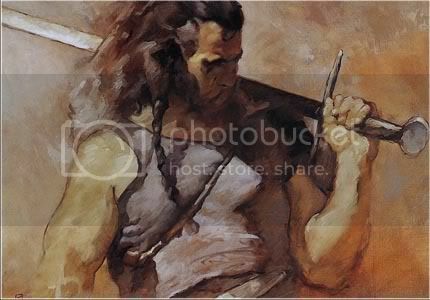 The image is painterly, Jones conveys feeling and mood more than detail, but I do like the weapon shown. That is a no nonsense war sword, with a medallion pommel, plain cruciform hilt, a long enough grip for two hands if needed, and a straight double edged blade with a diamond crossection. That's a killing tool, not some silly over sized fantasy weapon. It gives the picture a sense of realism that I like. Edmund Dulac again, this is from an edition of Shakespeare's The Tempest that he illustrated. The wizard Prospero is the subject. 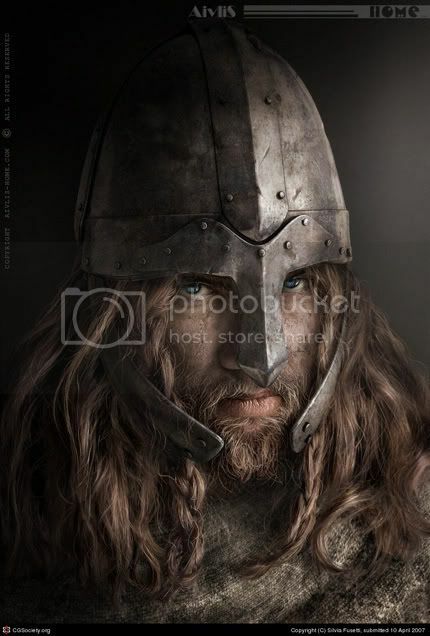 I think this is a great image for an oeridian magic-user, dark brown beard, goldish olive skin. I may start printing and adding these to character sheets, they'd look much more inspiring than my standard stick figure waving a stick. Of course, then I'd get all mopey when they fell in a pit and died. This is clipped from a larger image by Harry Clarke from an illustrated Edgar Allen Poe's collected works. I see these two as latter day nobility of the Aerdi, the Oeridian tribe that founded the Great Kingdom. Now as sophisticated and decadent as the Suel once were, and soon to sink into depravity and ruin. Success has it's own costs. This is an illustration done for Hans Christian Anderson's fairy tales by Edmund Dulac. Around 190-something, I don't recall now. I can't think of anything recent that has this sort of detail and life in it's illustrations. Even with the early chromo-lithography printing this was scanned from, the longer you look at it, the more little details you pick up. 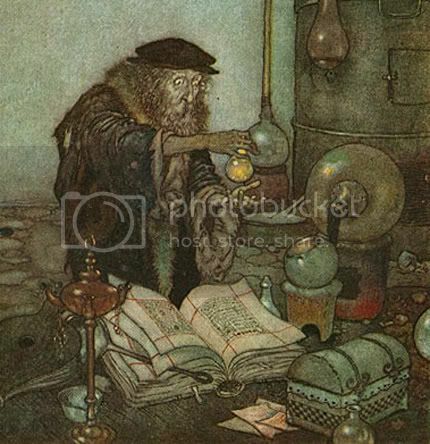 I love this Alchemist/wizard, the golden glow of whatever it is he's created in that bottle reflected in his eyes. 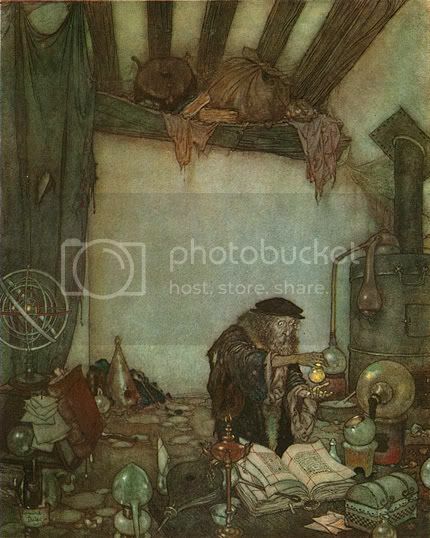 The armillary, books, bottles, chests, lamps, and, dare I say it, accoutrement's of wizardry all about the room. Here's a cropped closer view of the wizard himself. 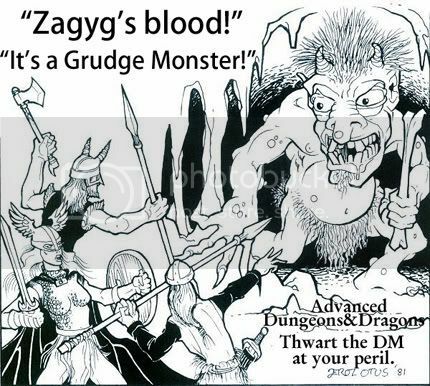 This is the quality of art I would love to see in Dungeons & Dragons books. 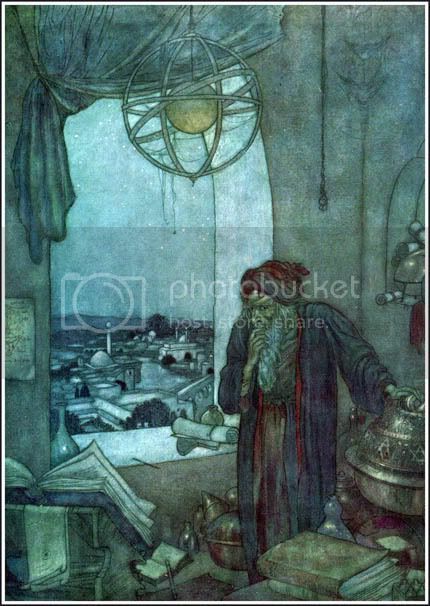 I would give your left arm to have a Dungeon Masters Guide illustrated by Edmund Dulac. What? I can't give my left arm, that's my shield bearing arm. Shut up and hold the torch higher, I can't see the bottom of the pit. Here's another illustration that inspired a new monster. This one is from Ciruelo Cabral, again I don't think it's been used in any official D&D material, but I'm not sure. Golden Bones are a type of undead skeletal guardian created to protect the grave goods of the most miserly and greedy of the deceased. Made from the skeleton of the tomb occupant himself, Golden Bones are singularly focused on defending their hoard. 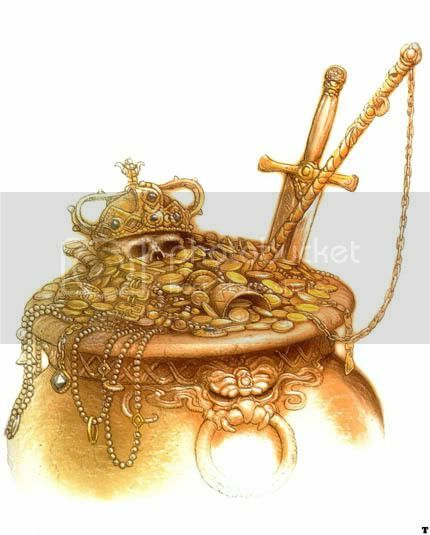 When first encountered, golden bones will simply appear to be a yellowish skull half buried in an urn, chest, or pile of gold coins and other treasure. If this treasure hoard is approached, however, the golden bones will stand up, revealing itself as a complete skeleton, totally covered in lustrous gold. It will then seize it's weapon, usually a bejewelled sword embedded in the coin pile, and attack. Tomb raiders may at first think they face simply a decorative version of the more frequently encountered animated skeleton, however, once the golden bones has taken half it's hit point total in damage, the true horror of the situation will be revealed. The golden bones will return to it's treasure, thrust in one skeletal hand, and regenerate it's lost hit points by absorbing the precious metal. Adventurers will see coins roll up the gleaming bony arm and meld into any damaged portion of the skeleton. 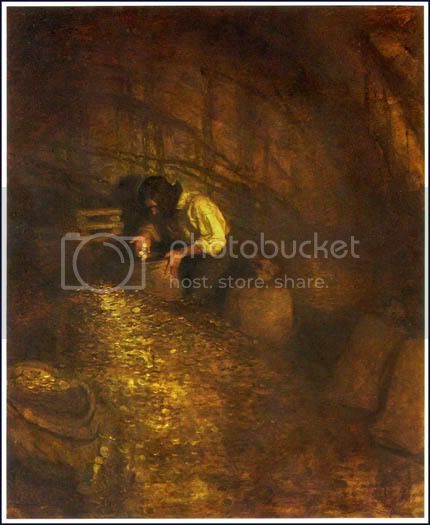 Characters will likely wail in anguish at the sight of the vanishing gold. Each time that the golden bones regenerates by re-plating itself from the treasure, it will reduce it's total value by 15%. The golden bones will continue to fight until it is destroyed, all it's foes are slain, or all of the treasure has been absorbed. Only by separating the treasure from it can the golden bones be prevented from regenerating. This stratagem creates new dangers, however, denied access to it's own gold, the golden bones may choose to grapple with a member of the party, absorbing whatever precious metals the character is carrying. The same as with lesser skeletons, the golden bones suffers only one-half damage from sharp and/or edged weapons. Sleep, charm, hold, and cold based spells do not affect it. If turned by a cleric, the golden bones will return to it's urn, resuming it's attack only if the treasure is disturbed. If it is destroyed, all gold coating the skeleton turns into a powdery ash and is worthless. This is page 32 of the Glossography for the Guide to the World of Greyhawk, 1983, second edition. 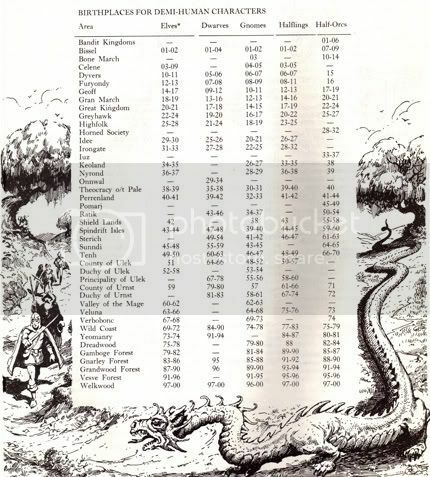 (second edition of the guide, not the game) The illustration wrapped around the demi-human birthplace chart is by Jeff Easley. The dragonish beastie preparing to ambush the party isn't actually anything listed in game terms in the Monster Manuel, but apparently just artistic license. I rather like it though, and that enormous tail gave me an idea for a special attack, so I thought I'd stat it out. Special attacks: tail whip 1-10, plus save vs paralyzation, or be "stunned" for 2-4 rounds. The Trailwhip dragon is an ambush predator possessing a dim, malignant intelligence. A long, serpentine, dragon-like creature, the Trailwhip will secret itself along side a Forrest path, or game trail. There it will lie motionless for long periods, waiting for deer, goats, sheep, adventuring parties, or any other such dull-witted, slow moving, herd beasts to pass. The dragon will then attack with a powerful, rolling undulation of it's tail, sending the blunt, armored end of it into the center of the herd like a gigantic bullwhip. Anyone hit must save vs paralyzation or be stunned for 2-4 rounds. The dragon will then rush from it's concealment, seize the victim in it's jaws, and carry him, her, or it, away to it's favorite devouring spot. Should there be any signs of pursuit, the dragon will vigorously thrash it's tail as it escapes, knocking aside any such rescuers. If attacking a party of adventurers, the Trailwhip dragon is just intelligent enough to avoid armored targets, instead, choosing mules, ponys, magic-users, or halfling thieves, should goats be unavailable. When I mentioned Zothique a couple posts ago talking about Erol Otus, It reminded me of this image I had buried on the drive. A little digging and, here we go. 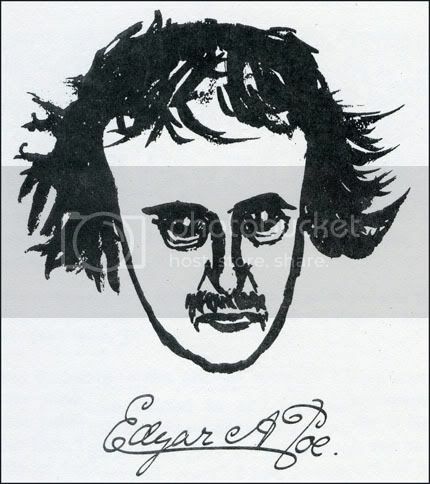 This is an ink sketch of Edgar Allen Poe done be none other than, Clark Ashton Smith, in 1915. At first glance, it's just a quick scribbling, cartoony little work, but the longer you look at it, the more unnerving it gets. Those eyes kinda freak me out after awhile. They look like pits in the night sky. I think I'll put this on a t-shirt. Kay Nielson, From East of the Sun, West of the Moon. For all of the debating and eye gouging that goes on over the various artists and styles of art that have appeared in the many products and versions of Dungeons & Dragons over the years, I think that the fact that there have been so many different artist's sensibilities involved has been an overlooked factor in the popularity of the game itself. Everyone has a different picture in their head of what the game world looks like, what the monsters look like, the appearance of their characters. Because this all goes on in the heads of the players and not on a screen in a theater, or the pages of a book, all involved are able to imagine the scenes that best suit their own taste. No conflict. Any of the early modules from TSR might have the work of six or more artists in them. These illustrations would have widely varying styles and approaches to the subject matter. With multiple visual styles to choose from, almost everyone could find something that appealed to them. People tend to focus on the things that attract them and ignore that which evokes no emotional response. That leaves them free to re-illustrate the module in their head to their own satisfaction, with the art style they like, and ignore the others. The lack of art direction for early TSR was a strength, not a weakness. The fact that later products have a gradually more and more unified art look is an obstacle to immersion in the game for those who's taste differs from the chosen look. At least in my own case, that is. Any way, The Suel. 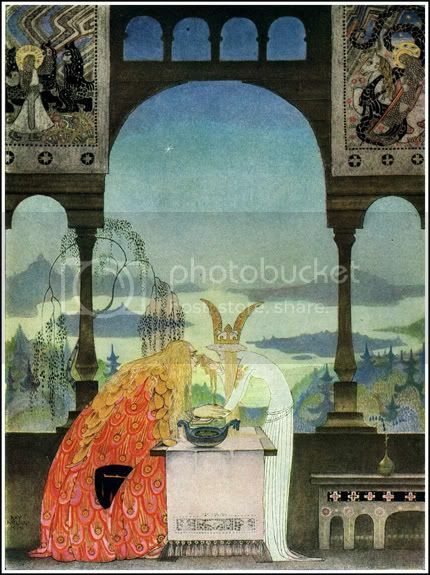 I said before I like to repurpose old art for D&D, and the Kay Nielson plate at top is allot like what is envision the old Suel Empire to have looked like. A somewhat Nordic people and culture in a land of green hills and lakes with a subtle and complex style of art and clothing. Before the Rain of Colorless Fire burned it all to ash, it would have been the jewel of Oerth. This is from Justin Sweet. Not at all an old picture, but one I think fits perfectly with my own mental image of the Thrillonian Peninsula. That far spear of land the survivors of the ruined empire fled to. 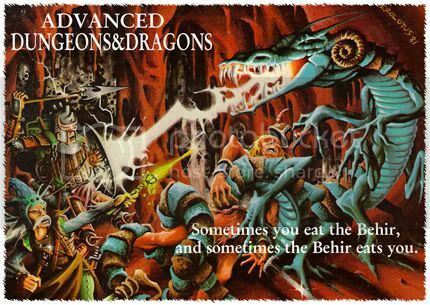 I found this image online, listed as untitled, and I have no idea if it has been used in any official D&D product. This is by Silvia Fusetti, I normally don't care for computer generated art, but the photo realism of this is brilliant. In my mind, this is what you're facing when the fruzti board your wallowing old cog off the coast of the Great Kingdom . Look at that guy's eyes and tell me you can't feel the hunger of the war wolf. 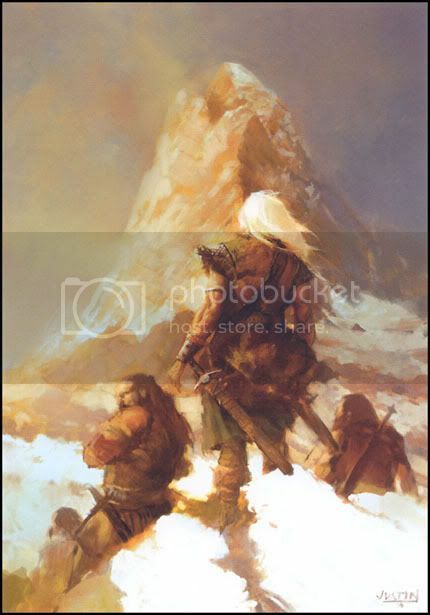 It wasn't the intentions of the original artists, but I've connected all three works to illustrate the mental image I have of the Suel of the World of Greyhawk. Each of these pieces is completely different in style, tone, and presentation. Any one of them may or may not appeal to you, but you are free to reimagine them as you wish. The point is, the grouping is not monolithic and uniform in direction. Heavy handed art direction chokes off a part of the viewing audience from the get go. If a style of art you don't care for fills a product to the exclusion of all others, you're a lot less likely to give it a chance. No matter how good the writing may be, I'm just not gonna pick up the module that's loaded with glossy images of spiky, strappy, pouch covered, manga-haired, leather wrapped, impractical armor wearing, dragon halfling warlord emo thieves. I've been slowly trying to teach myself to use photoshop. I haven't advanced very far yet, but I've made myself a couple of t-shirts as stylish convention wear. At least from my most narrow of perspectives, they are. My wife fails to be impressed, though she most patiently listens to my subtle expositions on the nuances of Dungeons & Dragons art of the old school. When I was a kid, I didn't care for Otus's style. It seemed to weirdly cartoony to me then, I was a Marvel comic kid and Willingham's stuff appealed to my superheroic tastes more. Now, Otus is my favorite of the early TSR artists. That weird otherworldly look to the adventurers, their equipment and their foes, fits perfectly with what I want in the game. Looking at that party struggling with the Behir, or the group confronted with the giant troll, makes me think about just how cool it would be to see Otus illustrate some of the sword and sorcery masters. Just you imagine what Clarke Ashton Smith's Zothique or Fritz Lieber's Newhon would look like seen through the fantastic opium smoke dream haze that Erol Otus could give it. I've had this game in my RPG collection for about twenty five years now, It's not D&D, It's so rules loose that it barely holds together, and like the cover says, it's a sick game. No matter who plays it, it manages to bring out the worst in them. Characters gain Victory Points for committing heinous atrocities. The more twisted, the more points. I thought I would post this game because it appears to have no presence at all on the net, though my google skills may just not be all that good. A lot of people just don't believe it exists when told about it. Carcosa caused a big furor online in the various blogs and forums I lurk about, and while I haven't read it yet, I seriously doubt that it could be any worse than Nihilistic Motorcyclists. There isn't any cosmic horror here to distance the players from the acts the game requires. The game is pretty much an rpg version of Mad Max and The Road Warrior, except the players are the psychotic biker nomads instead of the protectors of a dying civilization. There is no provision for playing any other sort of character, and once the game is under way, it's surprisingly easy to get sucked into pure barbarism for it's own sake by the pack dynamic. 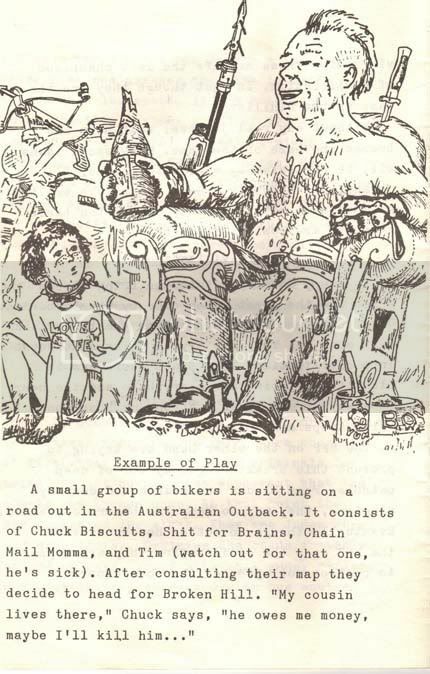 The Toecutter and the Lord Humongous were girl scouts compared to the sort of characters that evolved during play. My gaming group only managed to run this game a few times. 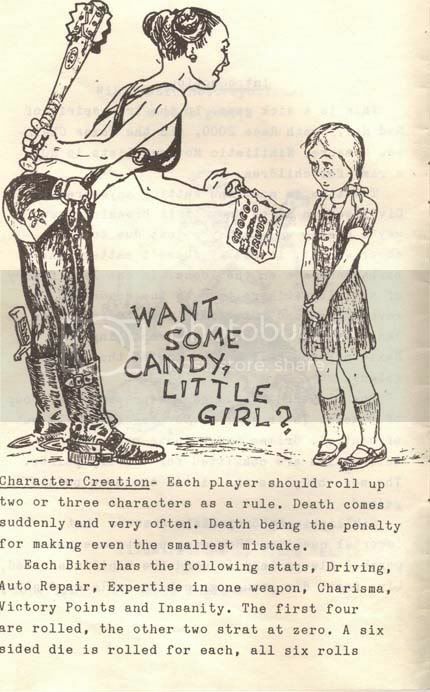 It just becomes too disturbing, you find your characters doing things that you never would imagine doing in D&D, or Gamma World, or any of the other games we ran at the time. Most people couldn't get beyond a couple of games, and that's when we were kids and death was still a joke. 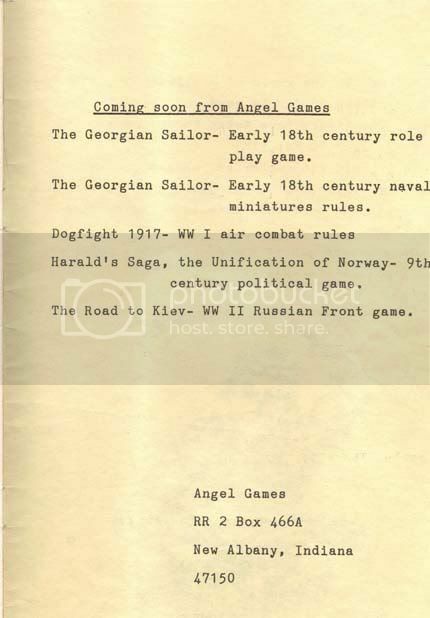 The game itself is a single little pamphlet of twenty pages, about five and half inches by eight and a half inches, folded in the center and stapled. My copy is in good shape, mostly since it has had very little use. There isn't any end game to this and there isn't any goal, other than the competition to commit the most, "henious sick perverse autrocities". You don't build strongholds or conquer new lands, and nothing is of value except gasoline. 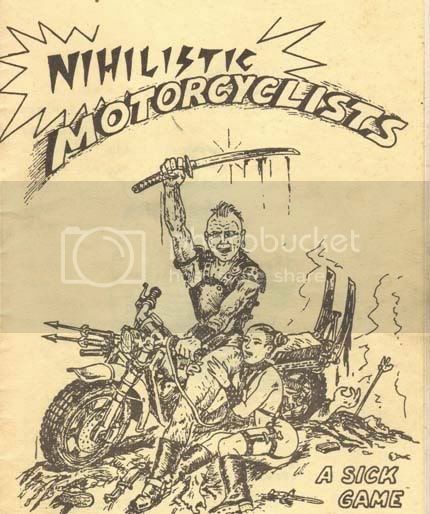 This post is neither to sing the praises of Nihilistic Motorcyclists, nor to tear it down. 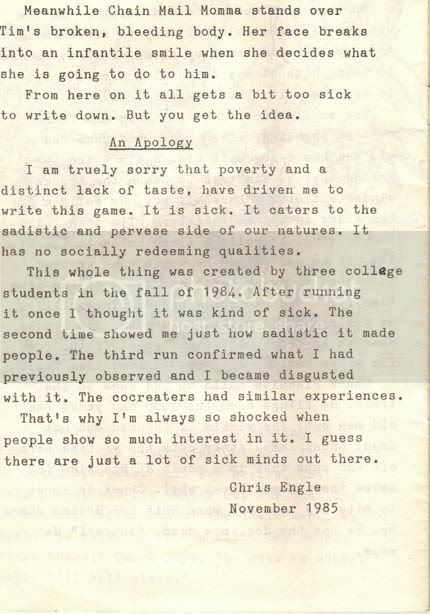 It's not the sort of thing I could play now as an adult, but back then, we were all full of geek kid anger at the world. I see this sort of thing as an artifact of gaming history. That's why I've kept it. Then again, I'm a terrible pack rat and compulsive archivist. I rarely let anything with writing on it escape my collection. What ever happened to Angel Games? 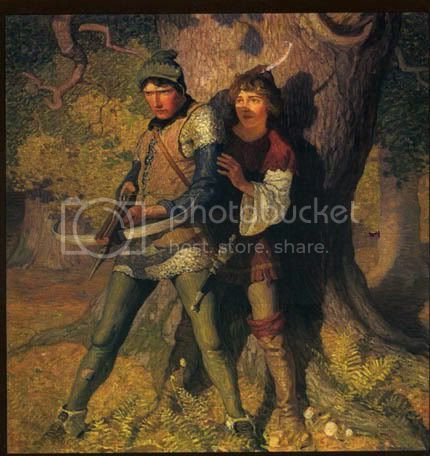 This is an illustration by Wyeth for The Black Arrow. Braving the dungeon with torch, crossbow and dagger! 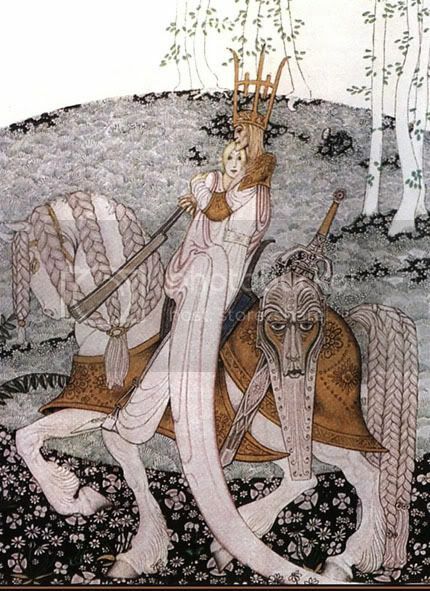 Edmund Dulac, from the Rubaiyat. Greyhawk was always my favored game world, and this is how I picture an old Baklunish master of sorcery. Wyeth again, this is from Treasure island, but it makes me think of the "no honor among thieves" illo from the Dungeon Masters Guide. I imagine this guy as the last survivor of an ill fated dungeoneering party, finally reaching the great horde. Alone. Another one from Wyeth's Black Arrow. I love his work. I sometimes make myself t-shirts with it. 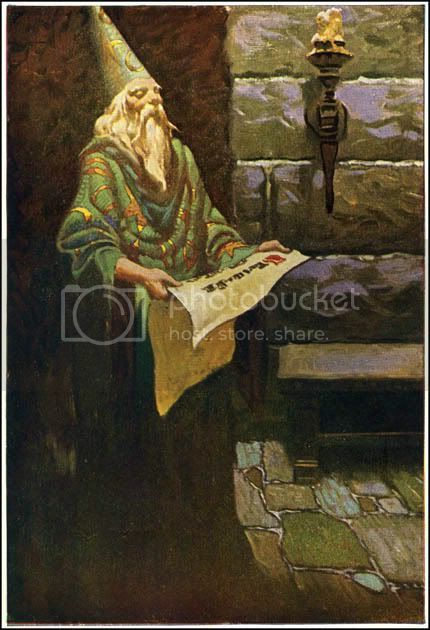 Godwin, Merlin from a book of King Arthur tales. A classic wizard, with pointy hat and rune covered robe.